- Proteins of therapeutic interest. Most of the enzymes that control each step of the flavonoid biosyn thetic pathway have been identified from a molecular and biochemical point of view. Nevertheless, little is known about the structural and mechanistic properties of enzymes which catalyze the last steps of the pathway leading to anthocyanins and proanthocyanidins, two major classes of compounds known to contribute to the organoleptic properties of many plant products and to have beneficial effects on human health. Structural investigations at atomic resolution, together with binding-equilibrium and kinetic studies, constitute useful tools to elucidate how enzymes work in the context of molecular pathways in the cell. 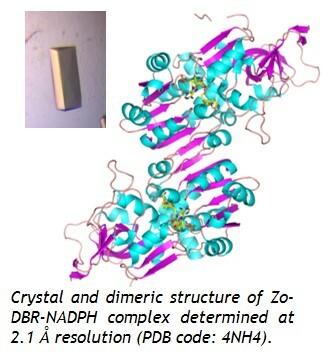 Current investigations concern enzymes such as dyhydroflavonol 4-reductase (DFR), anthocyanidin and leucoanthocyanidin reductases, anthocyanin synthase and others from Vitis vinefera. - Pr S. Antonczak, Université de Nice Sophia Antipolis (France). In a similar way, we contribute to the investigation of secondary metabolite pathways in model aromatic plants (sweet basil, turmeric and ginger). 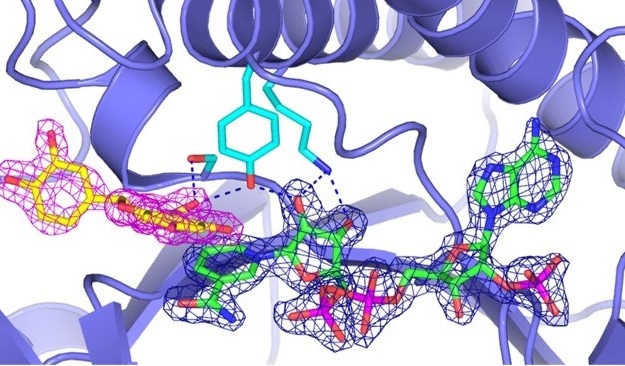 Enzymes under investigation are curcuma synthases, polyketide synthases and double bond reductases involved in the biosynthesis of curcuminoids and gingerols. - Dr D.R. 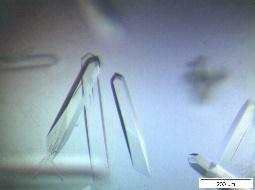 Gang, Institute of Biological Chemistry, Washington State University (USA). Protein-protein interactions are a central issue in biological processes, and represent relevant therapeutic targets for the treatment o f many diseases. The design of antagonistic molecules directed towards the disruption of these interactions requires the specific recognition of relevant protein surfaces. Aromatic oligomers present all the properties (high functionalization, stability and easy predictability of the structure, length flexibility) to reach that point. 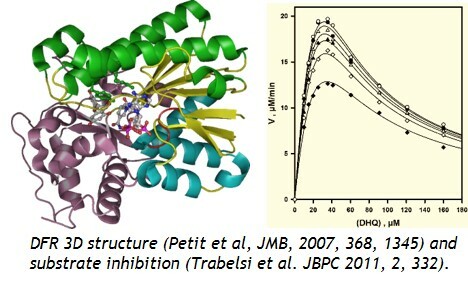 In collaboration with Ivan Huc’s group(*) (who gained large expertise in the biosynthesis of quinoline derived oligoamide foldamers), we are particularly interested in validating a novel approach based on combining covalent attachment and structural characterization to decorate a foldamer with proteinogenic side chains, so that it can bind a given protein surface. 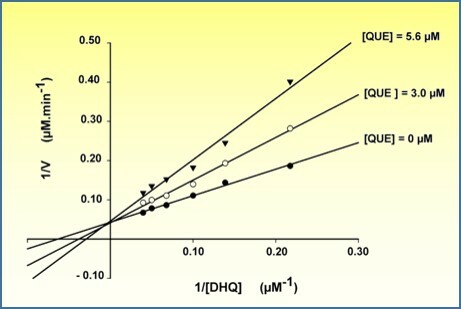 Key preliminary results have been obtained using human carbonic anhydrase II. This enzyme was selected as a model system because it crystallizes easily, and it binds inhibitors with an affinity in the nanomolar range. Other proteins are currently being targeted. - Dr I. Huc, CBMN & IECB, Bordeaux, (France). - Dr C. Mackereth, ARNA INSERM U869, Bordeaux (France). Organ dysfunction due to ischemia, such as myocardial infarction, stroke or organ transplantation (ischemia-reperfusion), represents a major cause of treatment failure. 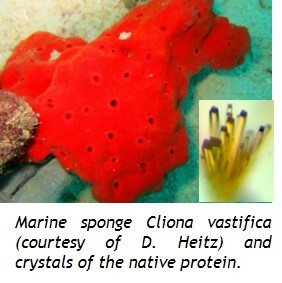 A small protein, the mapacalcine, (MW 19 kDa) produced by the marine sponge Cliona vastifica is a specific blocker of calcium influxes particularly resistant to all known calcium channel blockers. Specific receptors for this protein have been detected in various tissues: intestinal smooth muscle, brain, kidney and liver. We demonstrated that the mapacalcine is able to protect hepatocytes and nervous cells against ischemia, thus increasing cell survival after an ischemic shock. - iii) to explore and apply the anti-ischemic properties of mapacalcine to pathologies linked to ischemia and particularly to organ preservation in graft protocols. 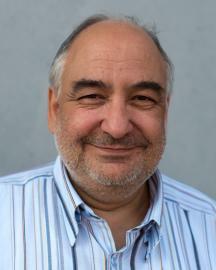 - Pr T. Hauet, IRTOMIT, INSERM U 1082 Poitiers (France): Ischémie Reperfusion en Transplantation d’Organes Mécanismes et Innovations Thérapeutiques. - Pr X. Santarelli & Dr A. Noubhani, ENSTBB, Bordeaux (France). Glypican 3 (GPC3) is a heparan-sulfate proteoglycan of which role in cell signalling remains to be unravelled. As a cell surface GPI-anchored glycoprotein and an extracellular co-receptor, it is involved in the control of growth factor/receptor interactions. GPC3 acts upstream of key signalling pathways (Wnt/β-catenin, Hh, BMP and FGF) involved in numerous cell functions. Intriguingly GPC3 has opposite effects in several cancers. It acts as a tumour gene suppressor in lung and breast cancers, and as an oncogene in hepatocellular carcinoma and hepatoblastoma. 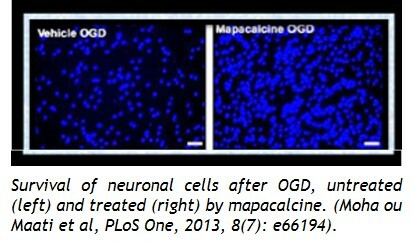 Our studies aim at getting more insights into GPC3 function at the molecular and cellular levels. Our strategy is based on the design and production of stable GPC3 mutants exhibiting well-defined activities on tumour cell growth. 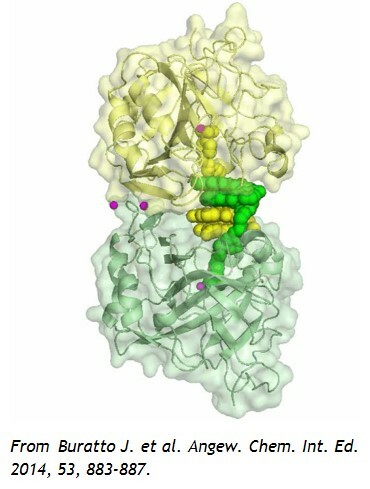 Solving the GPC3 3D structure is the starting point to identify small inhibitors by molecular docking. 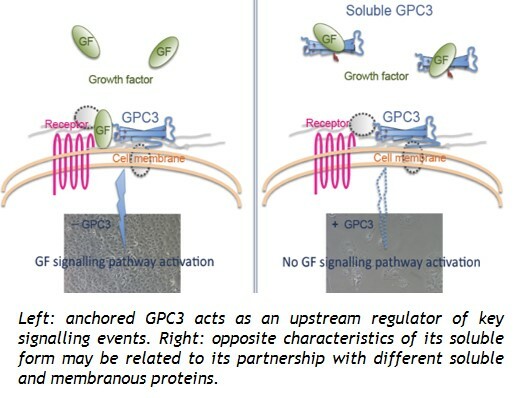 Identification of GPC3 partners allows getting more insights into the signalling pathways involved in tumorigenesis and possibly opens the way to new therapeutic strategies. - Pr X. Santarelli & Dr G. Joucla, ENSTBB, Bordeaux (France).